Until now, I've never spent any time in the New Mexico state parks, but I plan to fix that this spring. My first stop was Elephant Butte SP, near Truth or Consequences, NM. And an adorable bird. Anyone know what this is? T or C has some really nice hot springs. We decided on Riverbend Hot Springs. It's right along the Rio Grande River. I loved the landscaping between the pools and the river. And went to Sparky's in Hatch, a famous place for another delicious lunch. So far, I'm really liking New Mexico! 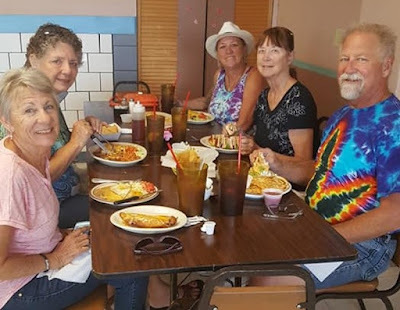 I next spent a week at the LoW Hi Ranch RV Park in Deming, NM, and had a blast! Lots of room in the boondocking section, and it was only $6 a night with Passport America. Do you think this guy has enough solar panels? Every week, the LoWs (Loners on Wheels) go to The Pink Store just across the border in Mexico. There's was rusty guy welcoming us - I was really excited! And the front door shows that they really appreciate the business. One day we went hiking in nearby Rock Hound State Park. We also went over to see Spring Canyon State Park next door, but passed on this hike. On Easter, the LoWs had a brunch with ham and lots other goodies. It was really yummy, and loads of fun. I've met so many new friends here! On another note, I got another photo in the Escapees magazine Viewfinder page. This time the topic was Nature's Paintbrush, and I can't imagine a better example than the Wave. I've been there 4 times, but you have to win a lottery to get a permit, and that's become more and more difficult.